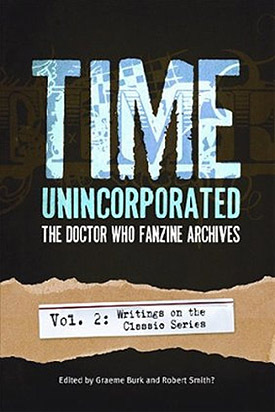 In Time, Unincorporated, the best essays and commentary from a range of Doctor Who fanzines are collected and here made available to a wider audience. In spirit, this series picks up the torch from Virgin's License Denied collection (1997), concentrating some of the most delightful, insightful and strange writings on Doctor Who into a single source. Volume 2 of this series contains nearly 75 essays that examine every era of the classic Doctor Who series that ran from 1963-1989, as well as the FOX TV movie (1996). The essays stem from a wide array of venerable fanzines such as Enlightenment, Shockeye's Kitchen, Burnt Toast, Faze, Dark Circus, The Whostorian and more. Collectively, the essays derived from these sources form one of the most diverse compilations of Doctor Who writing ever produced. As a bonus, ten of the essays were written exclusively for this volume by the likes of Matt Jones (Doctor Who, Torchwood), Simon Guerrier (The Slitheen Excursion), Pyr Books editorial director Lou Anders, and Jim Sangster (TV Heaven).